"Hey! Hey, you! Dog! Stop!" Dogs have an uncanny ability to know what's going on even if those around them have no clue. There's a powerful connection between dogs and nature which is even stronger in Beasts of Burden: Wise Dogs and Eldritch Men #1 from Dark Horse Comics. The issue is written by Evan Dorkin, illustrated by Benjamin Dewey and lettered by Nate Piekos. When supernatural occurrences sweep the community of Burden Hill, it's up to a heroic gang of cats and dogs to keep residents safe from harm. A bizarre disturbance leads these four-legged neighbors on a wild-goose chase into the depths of the nearby forest, where loyalties are tested and lives come to an abrupt end. 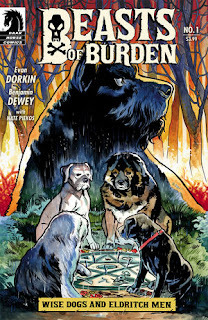 The most immediate reaction to Beasts of Burden #1 is the way Dorkin infuses the dog characters with traits and personalities that are befitting of their breeds. The dogs are presented with an attention to power structure as Dorkin informs the reader that there's an order to things--even among dogs. The way Dorkin allows the dogs to demonstrate emotion is fascinating, primarily based on the first encounter where a fiery (literally and figuratively) salamander is losing control. There's an undercurrent of mysticism throughout the issue as Dorkin leans into the combination of animals and magic--playing one off of the other. The foreboding at the end of the issue is well done with Dorkin offering up a tantalizing direction for the series to pursue. The artistic approach by Dewey really helps set off the tone of the book. Dewey's art style is very loose and feels watercolor-inspired at times, evoking images of nature at every turn. Each of the dogs are illustrated with an emphasis on physique, infusing the characters with a sense of presence and weight as they interact with one another. The panels are arranged cleanly throughout the issue as Dewey evenly presents the action so that the reader can follow along quite easily. The colors are also somewhat washed out as Dewey presents a look that feels as if there's a filter applied. Beasts of Burden: Wise Dogs and Eldritch Men #1 is a book that capitalizes on the notion that dogs are superpowered and fight to preserve nature and their habitats. The dogs at the center of the story take their roles very seriously, relying on their magic and abilities to protect those around them. Dorkin's script is straightforward and engaging, with all the dogs performing a delicate balance of magic and awareness. Dewey's artwork is thoroughly enjoyable and offers a great look at the concept of dogs as magically-infused. Beasts of Burden: Wise Dogs and Eldritch Men #1 is a solid start to the next chapter of the series. Beasts of Burden: Wise Dogs and Eldritch Men #1 is available August 22.